Hopefully, you are reading this from the warmth of your office or home. As you are certainly aware, we are right in the middle of what is called a cold snap. Basically, it’s cold outside, bitter cold, and it doesn’t look like it will be warming up anytime soon. And you will be waiting several months to enjoy temperatures in the 80s and 90s again. The cold weather might be overwhelming, scary even. You might be having a hard time when you drive as the windshield keeps freezing up and you find yourself sliding on an icy road. When it comes to cold weather and your car, there are facts and there are myths that need to be sorted. For example, you might think that filling your trunk with sandbags will give you better traction. Will it? If that does work, great. But if this is just a myth, then you will feel like a fool driving around town with 200 pounds of sand in your trunk and nothing to show for it. 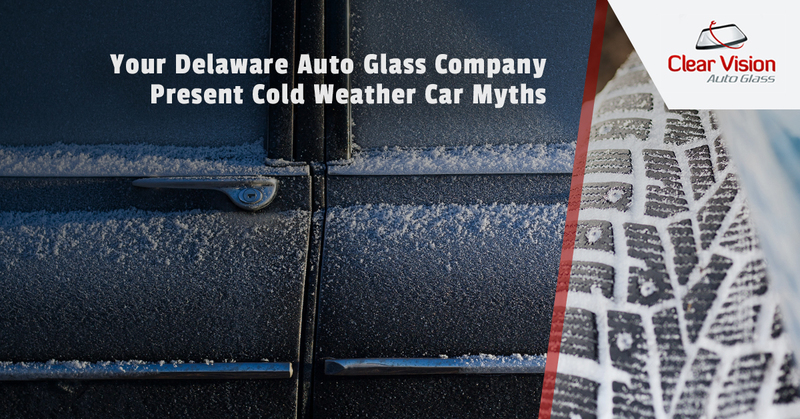 So, Clear Vision Auto Glass, serving Delaware, New Jersey and Pennsylvania, presents you with cold weather car myths. Back in the day, the average car was a rear-wheel drive sedan that was front-heavy with a weighty V-8 engine. The cars of this era were also fitted with marginal bias-ply tires. For these reasons, a few hundred pounds of weight in the truck could make the difference between making it up that ice hill and simply spinning your wheels. The majority of cars today are either front-wheel drive or, even better, all-wheel drive, so that added weight in the trunk isn’t really doing much. Even the few rear-wheel drive vehicles have better weight distribution and are fitted with better tires so added weight isn’t needed for traction. That said, if you happen to drive your 1964 Chevy Impala to and from work every day, go ahead and load that bad boy up with a few bags of sand to improve traction. If your car starts after spending the night in sub-zero temperatures, it should start up after sitting in your office building parking lot for eight hours. If not, then maybe it’s time to get a tune-up. While this is statistically false, it feels all too real for many car owners. There is a reason for this; when your car battery dies in the middle of a cold streak, it is more memorable and certainly more noticeable. This can be attributed to the fact that it is not fun having to sit in a freezing cold car waiting for help to arrive. If, for example, your battery would conk out in May or September, you just chalk it up to a bit of bad luck. This is an instant hardly worth remembering. But if you suffer a dead battery when it is -5 degrees outside and blowing snow, you won’t forget that anytime soon. Let’s just get this straight once and for all; your car won’t benefit from being warmed up before you actually drive it. In fact, you could be hurting your engine and you are most certainly polluting the air while your car ides unoccupied for 20 minutes while you down a second cup of coffee. You car will warm up much faster when you drive it. As the temperatures continue to drop, it is important that your windshield is free from damage. If you have cracks in your windshield, contact Clear Vision Auto Glass today.